Thinking back to my own high school years which all fell in the 1960’s, those were some pretty rough times. Kids are cruel to each other. If you had the typical teenage short sightedness which I certainly did, it can be tough to see past it. 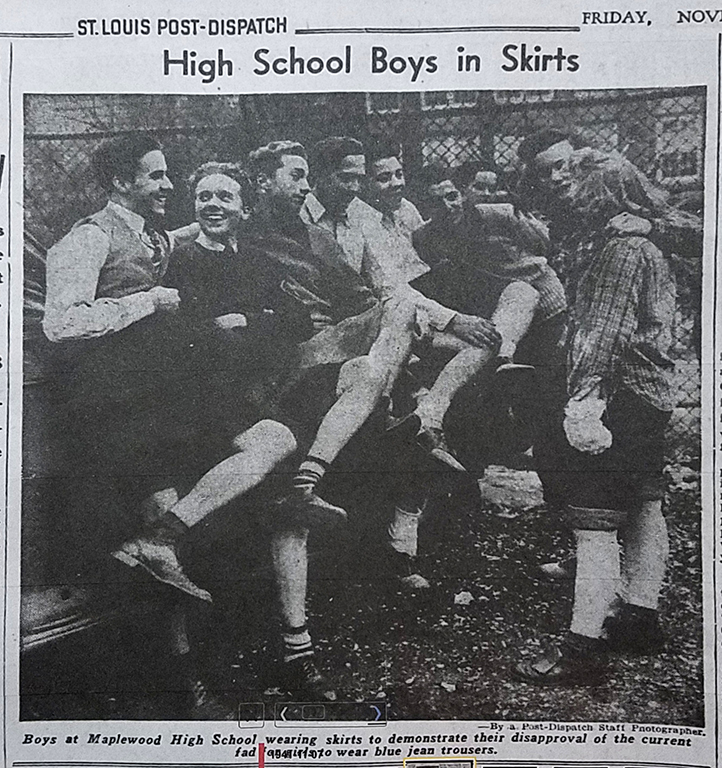 I hadn’t realized it until I started thinking about this latest information from our memoirist, Bill Jones, but back then regardless of age the women always wore skirts and dresses. I think. Just coming off of this bitter cold spell a dress code such as that seems remarkably unfair. I’m happy to report that we’ve made a lot of progress since then. Just like many other struggles, the freedom to wear whatever you want was begun by a small group of activists. These brave females chose to make their statement in 1941. 20+ years later they still hadn’t won that battle. Now they have. I salute these forward thinking ladies of Maplewood. Our young ladies decided they would “prefer” wearing jeans to class. This is seven decades ago. We had no rules at our school about this matter so a couple of lady students started the movement– more joined in the following weeks. about a dozen boys helping. in front of the car and “politely” asked the fifty students to go back to school. He told them THEY were on city property. The students complied and they all showed up the next day in their usual skirts and trousers. Their only words were “We made our statements” and Mr. Vossbrink went on vacation! I was an underclassman and distanced myself from the entire “no winner” incident. I was a Harper’s Drug Store “soda jerk” after school and an honor student (no skirt). We are indebted to Bob Rollins for saving these photos and article from the November 7th, 1941 Post-Dispatch. He is the second from the left. 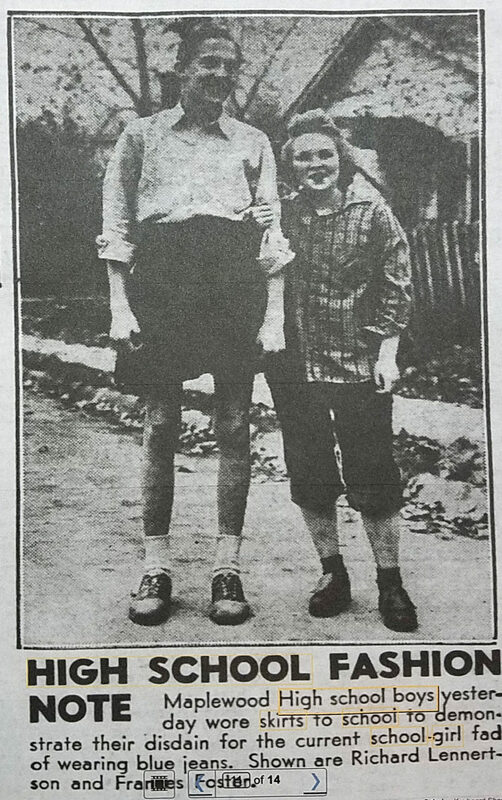 This photo ran the day before on November 6th, 1941. Pictured are Richard Lennertson and Frances Foster. Brings back fond memories of ’69 -’70. I moved to Arizona in my Jr year of high school. At McCluer the debate was whether or not girls could wear pants. (Pants were not yet allowed.) In Tucson, the debate was how short your cut-offs could be. By the way, flip-flops were allowed. What a culture shock it was, but in a good way. I can’t imagine that freedom, Patty. About ’66 or ’67 myself along with some like minded rebels openly challenged the dress code at Herculaneum High by failing to wear…socks. Sad, isn’t it? If my memory is correct we got away with that one. That is a very interesting comment you made. Thank you. Those were interesting times, for sure. Bell bottoms, hip huggers, mini skirts. And, what!? No socks? So rebellious! Phyliss, you were way out in front. I wouldn’t have tried that in Switzerland though. As always it’s nice to hear from you. My first year at Jr. High was 1971, we finally got to wear pants suits (no jeans yet). Thank to the rebles that came before us! Thx, Doug! Love the history. 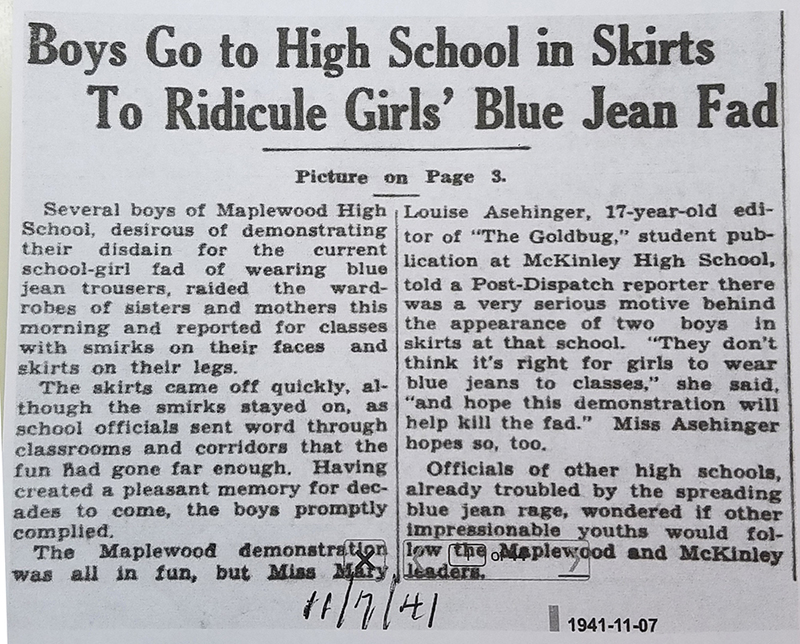 Being a 60s Maplewood student, I would share that girls DID wear “snow pants” under skirts in inclement weather. But, yes, dresses and skirts was required attire. It was still the 60s when I student taught out of Harris Teachers College and we were warned by the professor that we were NOT to be caught wearing the newly trending pant suits when we taught–even if we were sitting on the floor or in tiny Kindergarten chairs. Took a long time for things to change! (I will say that we still recommend that young teachers NOT consistently wear jeans to school. Better dressed teachers DO tend to get greater respect!) Again, thx for the cool things you share! Pickett, thanks so much for all of this interesting information. I tend to regard dress codes as relics of the past. I much prefer the choice of attire to be left up to the individual. My jaw dropped last summer while vacationing on Mackinac Island. On the walk leading up to the Grand Hotel was a sign that read something like this. “After 6 PM, in the hotel and on the street in front of the hotel, men will wear jackets and ties. Women must wear dresses. ” As I expressed my amazement to an employee of the hotel he volunteered that they had extra jackets and that they would loan me one. I told him I would not put one on if they offered it. In my mind, it was part of a uniform of a club I never belonged to and didn’t even approve of. I’m a fan of Mark Zuckerberg’s approach to fashion. Thank you for your insights on this. Pickett Lema was a member of our historic community book committee. There are certainly jobs where there are dress codes. For me as a musician, wearing black is common either in a suit or a tuxedo. It’s simply part of the job. No big deal. However, if I don’t respect the dress code I don’t work. If I don’t work I don’t keep a roof over my head. I’d rather work. Well, of course, I understand there are jobs where there are dress codes, Gary Lee. What I object to is someone else deciding what I should wear. Pickett, this story and your response brought back my own memory of acceptable attire in the 60’s. Skirts or dresses WERE required, but at that point the MRH Powers That Be had not yet been faced with ruling on the length of said clothing. Common sense and modesty were supposed to take care of that issue. But when I began to see “mini” skirts” in Seventeen magazine, I thought, “Why not? !” So my next dress purchase was a mini, ( back then meaning only about 4″ above the knee….HA!) which I immediately wore to school! I believe I was the first young lady to show that much leg, not even the cheerleaders on Spirit Days were so bold! HA! Now, I was a good kid, a good student, and a good citizen, and not one authority said a word about it, and soon we began to see other knees appearing! I didn’t consider my self a trendsetter, but it WAS a first for our conservative little Midwestern school! You definitely were a trendsetter, Jill. Thank you for your recollection. The shoes in the second picture! Saddle shoes and it looks like Mary Janes with anklets. Talk about dated! I remember my mother called them saddle oxfords. Good to hear from you, Esley. I agree with Wanda – the two in photo look middle-aged! Thank you for bringing this small “revolution” in Maplewood to our attention. I should point out that is took women over 70 years of organized agitation to get the privilege of participating in our democracy when they finally got the vote in 1920. So 30+ years for the privilege of wearing jeans seems about right. I refer all, who are interested, to the story of another historic women’s struggle in today’s NY Times describing a Hollywood dancer who had the courage to bring assault charges…in 1937. Peter, Change is gonna come and it’s gotta start somewhere. It is sad how long these things can take. Women did not gain the right to vote nationally in Switzerland until 1971. I will take a look at the article you mention. 1937! This person was way out in front. Thanks for your observations. 1971??? Holy Cow, I knew Swiss businessmen were tough, nasty customers, but had no idea they continued to “keep their women in their places” too — for that long — unbelievable!!! Oh Em Gee!!! Unbelievable picture, Doug! I can’t stop laughing. That couple do not at all look like high school students – more like middle-aged. Hey Wanda, A poor photocopy of a newsprint picture has robbed them of their youth. I’m glad you got a kick out of this. Thanks for commenting.